My glass windows quadri luce / light paintings, are not merely space-dividing or sun-shading windows, but rather living surfaces that are transformed by each subtle shift of light. The glass captures and integrates rays of light which become essential elements of these “light paintings” each designed to enhance the specific context of its installation. The intensity of the light is embellished as it passes through these surfaces, sliding quickly along, caressing the glass and creating luminous plays of colors and hues. Their transparency must be as vivid as possible: fluid and brilliant, ready to receive every bright sparkle inherent to their location. The juxtaposition of additional, autonomously painted elements – free-form, cold-worked murrine – bring another dynamic dimension to the compositions. From the splendor of Gothic church windows to the elegance of Tiffany, decorative glass panels have never ceased to enchant us. Today these ancient techniques can be applied to deliver contemporary patterns of beauty to adorn and individualize our living spaces. ENGRAVING, CASTING, SANDBLASTING and MIXED TECHNIQUES treated with enamel varnishes, minerals, grit, metals, or powdered glass… Ancient and modern techniques converge in new intriguing creations of transparency that remain, in particular, expressions of modern tastes and contemporary style. Magic and surprise are the elements that characterize these pieces, each one unique, exclusive and imaginative: the result of an ongoing process of exploration and invention. 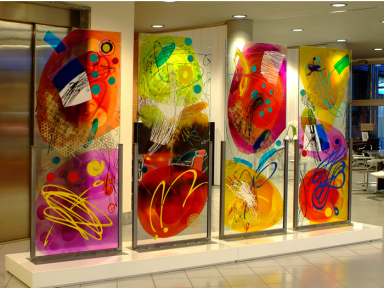 The glass panels I design and create can be used in a wide range of applications: as doors to rooms or cupboards, as tiles, as walls or room dividers, for table tops, ceilings and horizontal or vertical murals….My light paintings lend themselves to a wide range of installations, both for public places and for private homes. Just as they do in my paintings, lines and scribbles unwind and entwine endlessly amid masses of colors on my works in glass, in an incessant dialogue/dance in search of perfect balance.